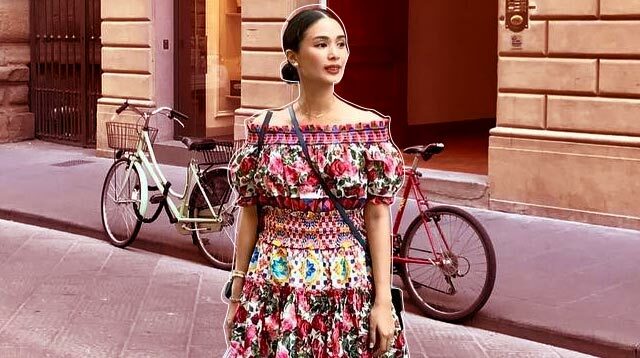 Being the jetsetter that she is, Heart Evangelista never really needs a good reason to travel—she just goes! Her recent destinations? Florence and Paris in Europe. Of course, this being a #LoveMarie vacation, there was no shortage of OOTD-worthy outfits. It was also pretty evident that Heart dressed for the season in mind—most of her combinations featured eye-catching prints, including bold florals. Heart began her trip in Florence, a romantic location that requires equally romantic ensembles. For a stroll through the city, the actress wore a collarbone-grazing Dolce & Gabbana dress decorated with gorgeous roses. Completing the equation? Her go-to Christian Louboutin pumps and Hermès Constance purse! Gucci's double Gs took center stage in this cool and cozy outfit. Heart expertly paired her midi skirt with a chunky oversized sweater and white platform sneakers. Muy bella! Heart continued her chic yet comfortable streak in the quaint Tuscan countryside, styling an embroidered Dolce & Gabbana tee with a full pleated watercolor midi from Zara. Love the artwork on her top! Armed with her signature bold lippie and sleek ponytail, Heart made quite an entrance in the City of ~Love~. A white tee and skinny jeans got the ultra-glam treatment via a dramatic floral jacket and super high T-bar pumps. Check out her designer brooches, too! No trip to Paris (at least according to Heart) is complete without dropping by Hermès' headquarters. For photo ops at the designer house's private rooftop garden, Heart played with patterns in a vibrant Dolce & Gabbana coat and polka dot skirt. Her bag of choice? Hermès' Mini Kelly, of course. IG-worthy outerwear is essential when traveling to a cold place. Heart livens up the requisite Eiffel Tower shot with a silk Gucci bomber in a lush botanical print. It's also the perfect way to brighten up a selfie!